If you're looking to find inspiration for a dessert or wish to add flair to a fruit salad, fresh pineapple's the answer. Juicy and sweet, this fruit conjures thoughts of the tropics, even if you haven't visited. Its skin and prickly top, however, can make it a hassle to prepare. If you'd rather keep your cooking quick and simple, canned pineapple is ready in seconds. One cup of fresh pineapple chunks has 82 calories, 21.7 grams of carbohydrates, 2.3 grams of fiber and 16.3 grams of sugar. One cup of drained, canned pineapple chunks has 109 calories, 28.2 grams of carbs, 2.4 grams of fiber and 25.8 grams of sugar. The calories, carbs and sugar in canned pineapple are higher than in fresh pineapple because the canned fruit is typically packed in fruit juice. 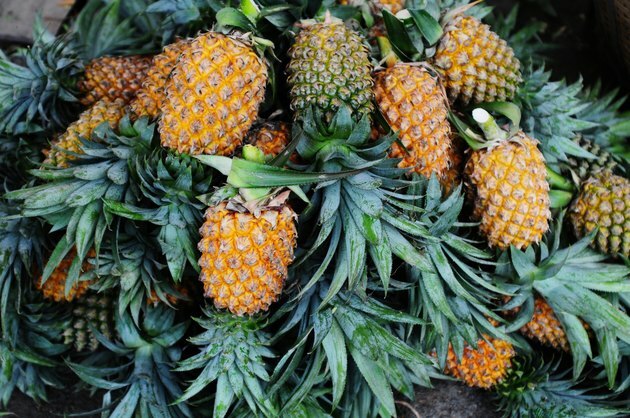 Per cup, canned pineapple has slightly more calcium, magnesium and potassium than fresh pineapple. The phosphorus and sodium levels of the two variations of pineapple are identical, and the iron and zinc levels are virtually identical. Pineapple's mineral values, in general, don't significantly help you work toward your daily recommended amounts. One cup of fresh or canned pineapple, for example, offers 21 or 29 milligrams of calcium, respectively, of the 1,000 milligrams adults need each day. Fresh and canned pineapple have significantly different levels of vitamin C. A cup of fresh pineapple has 78.9 milligrams of the vitamin, while the same amount of canned pineapple has 17 milligrams. A serving of fresh pineapple provides a significant amount of your recommended daily intake of the vitamin; women should consume 75 milligrams and men should aim for 90 milligrams. Fresh pineapple is also higher in folate and niacin, with 30 micrograms and 0.8 milligram, respectively, compared to 9 micrograms and 0.5 milligram in canned pineapple. Women should get 14 and men 16 milligrams of niacin per day. Adults should get 400 micrograms of folate daily. When trying to decide whether to eat fresh or canned pineapple, consider how each type of the fruit impacts your personal health choices. If you strive to eat a low-sugar or low-carb diet, fresh pineapple is a better choice. Although most people get enough vitamin C in their diets, fresh pineapple is a healthier choice if your diet doesn't include many vitamin C-rich foods such as fruits and vegetables.